Address: Calle Las Breñas, s/n, Playa Blanca (Lanzarote), Islas Canarias. Apartments at Caybeach Sun are located beside the beach in Playa Blanca and are set around a series of fantastic open-air pools and landscaped gardens with palm trees – enjoy playing on the tennis courts. Each of these bright and airy Cay Beach Apartments has 1 or 2 bedrooms. You can cook up a feast in the well-equipped kitchen and then dine with friends. 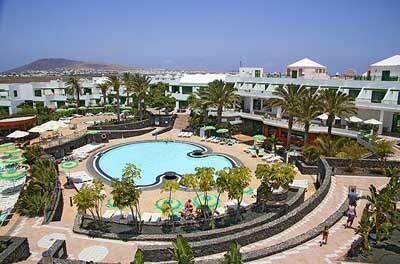 Soak up the glorious sunshine which Lanzarote enjoys the majority of the year and then cool off in one of 2 pools. Children will have fun and make friends in the children’s play area and in their own, separate pool. Let yourself be entertained by the Cay Beach Sun Lanzarote’s fantastic entertainment programme with activities for all the family. Stay outdoors and active with a game of tennis and then relax with a drink from the poolside bar. You can also enjoy a light snack from the bar. Enjoy a good book or an afternoon siesta in the pleasant shade of the Cay Sun Beach’s palm trees. Please note that payment for the total amount of the reservation is due upon arrival. Please note that guests under 18 years are not allowed in the indoor swimming pool.